In April 2019, auto enrolled savers paying minimum contributions will see their contributions rise from 5% of qualifying earnings to 8%. But, the way auto enrolment contributions are calculated, means that no saver will actually receive the full 8% of their salary into their pension pot each pay period. Auto enrolment minimum contributions are based on a band of ‘qualifying’ earnings. This means that for the 2019/20 tax year, the first £6,136 of an employee’s earnings does not count for the purposes of auto enrolment and anything over £50,000 isn’t included either. For example, if an employee earns £20,000 their qualifying earnings would only be £13,864. 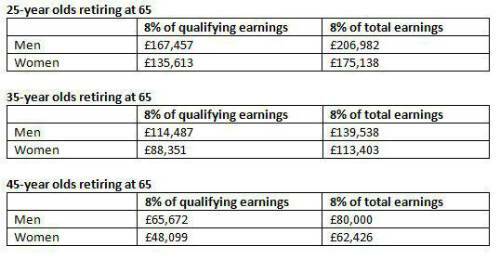 For somebody earning £10,000 only £3,864 of their earnings would be pensionable. NOW: Pensions carried out some analysis comparing outcomes based on 8% of total earnings compared with 8% of qualifying earnings. The analysis is based on average* salaries for men and women, assuming 3% per annum investment growth. On average savers who make contributions on a qualifying earnings basis have pension pots which are 26% smaller than those who make contributions on every pound of earnings. Commenting on the analysis, Adrian Boulding Director of Policy at NOW: Pensions said: “Auto enrolment is working brilliantly getting more people than ever before into pension saving. But, the way contributions are calculated is selling savers short. “Most people assume their contributions are on every pound of their earnings but, in reality, nobody making auto enrolment minimum contributions gets 8% of their salary into their pension pot every month. “Each year the lower earnings band increases so the amount savers miss out on creeps up. Getting rid of the earnings bands, making contributions of every pound of earnings, would significantly improve retirement outcomes for millions of people but would be especially beneficial for low paid and part time workers who are more likely to be women. Be the first to contribute to our definitive actuarial reference forum. Built by actuaries for actuaries.